Official “smokin'” cover, may be played only outdoors . Also available with Nicorette Patch Edition and special Vaping Edition, suitable for smoking areas. 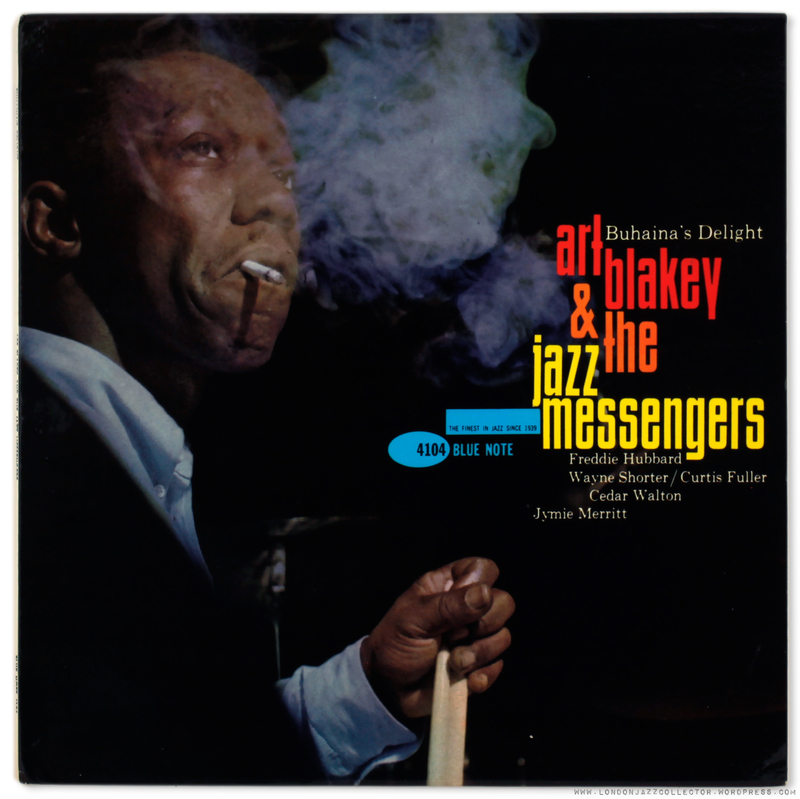 “Buhaina’s Delight” is a reference to Art Blakey’s rarely mentioned chosen muslim name, Abdullah Ibn Buhainia. Every one had to have one. A sextet line up, Freddie Hubbard on trumpet replacing Lee Morgan, Curtis Fuller trombone, and Cedar Walton on piano replacing Bobby Timmons. Wayne Shorter fronts on tenor sax, Jymie Merrit on bass. Different musical voices, and exciting performance. Even Henry Mancini’s “Moon River” sounds fresh, and the interplay between Hubbard and Fuller, with Wayne Shorter’s tenor and Walton’s solid underpinning, is indeed a delight. Mono original pressing on NY labels with “ear” and “VAN GELDER” in the runout, no deep groove either side. Fred Cohen’s Guide to First Pressings declares this title should be Deep Groove both sides. This copy is, however, not DG both sides. There were a variety of configurations at this time. Pictured here is the same title with DG Side 1 only. Then there are other copies which are DG only Side 2, shown below. In 1961-2 the dies which fixed stampers in place in the factory press were being retired and eventually replaced by dies which no longer left behind the deep groove. During the transition, numerous Blue Notes with nearby catalogue numbers are found with deep groove on only one side, sometimes side 1, other times side 2. Whilst Cohen provides a definitive statement for 1st pressing of each title, it becomes an article of faith that only one of these permutations is the “1st pressing”. For some time the notion gained currency (Alan Songer) that 1st pressings at this time were favoured with the use of the new non-DG dies, and repressings used the older (presumably more-worn) DG dies. Which at this time would make the no DG issue the most likely 1st press, and mixed DG later. There is a trade off here between intellectual purity, the need for certainty even if there is none, and the embracing of chaos, confusion and uncertainty. I’m with the last one. Consider: if you were a grunt in the Plastylite factory in 1962, loading stampers into presses for today’s run, and there was a bucket full of dies, old and new, all of which did the same job, how likely is it that you would discriminate between them? They all did the same job, holding the stamper. Before 1960, only DG dies were used because that is how they were all made. It’s proof of provenance. Through the early ’60s, with the growth in home listening and growth in record sales, more record presses installed, and more dies manufactured, to the new pattern. The old dies based on the diameter of the 78rpm record eventually disappeared. That is why many of the records manufactured at this time bore DG one or other side, then both, then neither. It didn’t matter. Next day another 2,000 pressings, change stampers, pick dies from bucket, different permutation. If anything, those pressed with the fresh stamper the next day will sound better than the last few manufactured the previous day with “1st pressing” status. So you pay your money, you make your choice. Beautiful laminated cover with dimpled gloss sheen in excellent condition. Cigarette smoke adds to the period ambiance. Blakey’s Buhaina’s Delight has been a gap in my Blue Note collection for some years. I chanced on this copy in a London store. The one drawback, reflected in the asking price, “Good Condition” which initially led me to dismiss it . “Good” usually means not at all good, but on second thoughts I asked to see the vinyl. I could see why how the grading was arrived at, bearing a number of prominent surface marks on both sides. However taking it to the window daylight and testing it with fingernail, it was clear the marks were entirely superficial. The maxim is “if you can feel it, you will hear it”. None of these “scratches ” were feelable, in all probability caused by skating over a smooth spindle top and not a turntable arm needle of tracking weight 10gm . The music should be intact. Too good to pass up. First play back home confirmed no clicks due to the marks, another win for play-grading over visual grading. A fresh lively original pressing, VG++ at a G price, a winner. 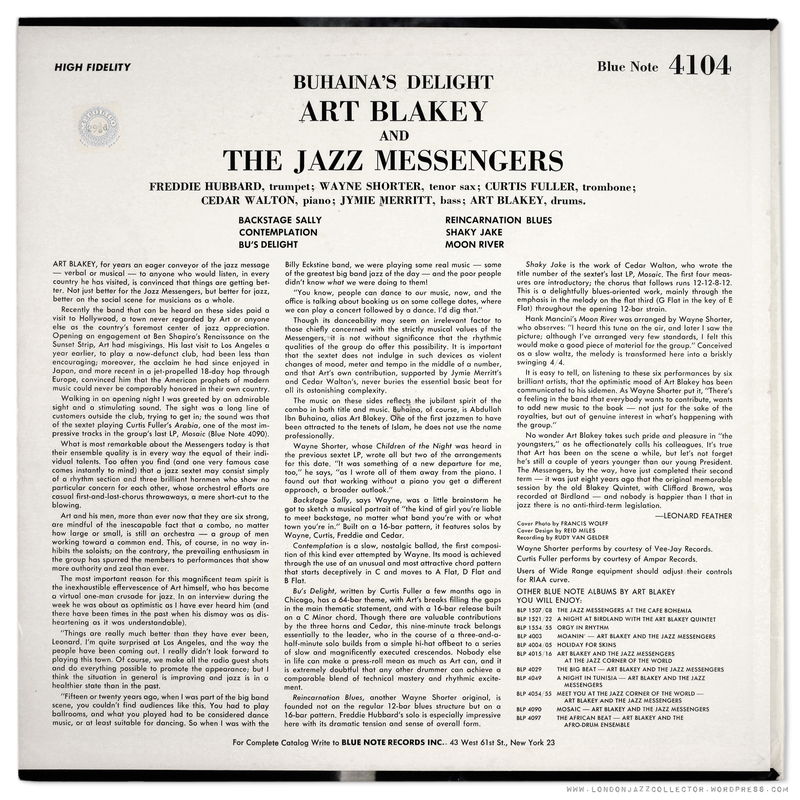 This entry was posted in Art Blakey, Blue Note and tagged Art Blakey, Blue Note, Jazz, Jazz Messengers, Vinyl by LondonJazzCollector. Bookmark the permalink. Just found a copy of this yesterday while digging in Chicago. It is DG on side one only, ear, Van Gelder stamp. Do you believe this to be first press? The copy you found looks to be DG side one only as well, correct? Hi Ryan, I’m embarrassed, this was among my first posts four years ago. A lot of things have moved on in that time, the knowledge and the photo-skills, so I have taken the time to update to today standards, and added an updated opinion on the role of Deep Groove in dating pressings. Hopefully this will answer your question. Thanks for clarifying the DG s1/s2 controversy. Found it next to a copy of the Big Beat that was DG side 2 only. Both were in minty condition with ear and sound beautiful so its hard to complain. Had never really listened to The Big Beat, it stands out. The Wayne Shorter composed tracks are where its at. I am a relatively young collector btw and appreciate and enjoy the site. I LOVE that picture of the gloss on the cover! Stand clear of fragile objects. £30 And I think they think I was the mug. This one was a winner. I can assure you I have been a loser too. Nice post, where do you think the best place to find this record would be? Hi, usual suspects, first try Discogs Marketplace, there are usually copies of the less rare Blue Notes for sale from somewhere in the world – US mostly – or try your hand on Ebay. Put up a search and also save the search, a copy will come up sooner or later. Thanks, I’ll keep you updated. Lovely one. Still on the wanting list here as well. Of course I can’t resist: what did you pay for it?? Knowing that it was presented as “G”, it must been under fifty quid?